The Library of Birmingham is not only the largest public library in the country, but it is also the largest regional library in all of Europe. 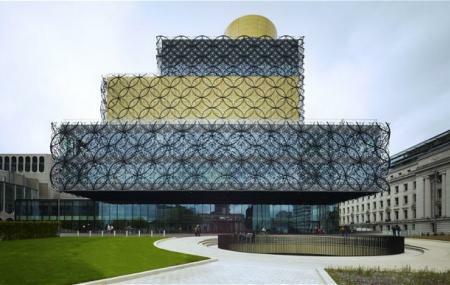 Replacing the Birmingham Central Library in 2013, it is a symbol of pride for all Birmingham residents, as it was designed by a leading architecture firm to end up looking less like a library and more of a postmodern masterpiece. Do not be fooled by the appearance, as the library boasts a collection of books from every field imaginable. If there ever was a heaven for book lovers, this would probably be it. It is no surprise that the architecture of the library has won numerous international awards since its inauguration. Constructed at a cost of £188.8 million, it has often been viewed as the flagship project in the city’s re-development. It may seem like a small price to pay considering the fact that in such a short span of time, it has revived the love of reading in people at a time where the book is in danger of becoming obsolete. The library houses many collections of national and international significance, such as the Boulton and Watt Archives, The British Institure of Organ Studies Archive and the Parker Collection of Children’s Books. The top floor of the library houses the most important collection of William Shakespeare in probably the entire world. With over 43,000 books, it is arguably the most complete collection of Shakespeare’s works there is. Apart from its collection of books and manuscripts, the Library also has a marvellous assortment of photographs, including the Warwickshire Photographic Survey. All in all, the Library of Birmingham was created with the goal of making everyone read books again, and to say that they did a good job would be a gross under statement. If you’re planning to visit the library, be prepared in advance to completely lose track of time. Also, visit the popular attractions in the city by following Birmingham itinerary 1 day. The library has been designed for easy access to all, and is wheelchair friendly as well. While the library is open to all, becoming a member entitles you to free Wi-Fi, borrowing books and music CDs and DVDs too. There are roof gardens on the upper level, which make for a serene reading atmosphere. Be sure to look for the secret garden to make your trip truly worthwhile- all you have to do is ask! Train: the Library is a 10 minute walk from New Street Station and 15-20 minutes from Snow Hill Station. Moor Street and Five Ways are further away but still within walking distance. Bus: Many bus services stop close to the Library on Broad Street including: 1, 9, 10, 22, 23, 24, 29, 29A, 120, 126, 127, 128, 129, 140, 141. Love this? Explore the entire list of places to visit in Birmingham before you plan your trip. Fancy a good night's sleep after a tiring day? Check out where to stay in Birmingham and book an accommodation of your choice. How popular is Library Of Birmingham? People normally club together Symphony Hall and Town Hall Birmingham while planning their visit to Library Of Birmingham. The old Central Library might not have looked attractive to many but it was a lot more relaxing and accessible. I really don't see what they had to shrink this library so much into this new, comparatively tiny cube which looks to me much like a giant wedding cake - is this because it was designed by a woman? Amazing space which is truly amazing when you stand in the middle on the ground floor and look up. As you would expect from a library it has lots of books and excellent resources. There are plenty of break out areas and study zones to go to and read and chill out. The Shakespeare room alone is worth a visit and the views from the balconies are amazing on a clear day. Also the cafe on the ground floor is well appointed. An all round great place to visit. We are so lucky to have such a beautiful building as the library in Birmingham. Endless selection of books, wonderful staff, handy cafe, beautiful viewing terraces and high escalators that feel endless this place is one of my favorite spots in Birmingham. As per library membership I love that they have a growing number of e-books which helps keeping the habit going! :) Thank you all the staff at Birmingham Library, I feel privileged to have the services you provide. The roof of this is one of the best places to view Birmingham from. If you are visiting Birmingham don't miss this place. But if you just want to study or read the papers there is an excellent selection. I can be difficult to find your way to the top, just take the lift,to the right of the first escalator, it's easy then. Don't miss the Shakespeare room and the secret garden. A great resource, the garden on level 7 is so quaint and beautiful in amongst the busy city, the viewing area at the top affords panoramic views of Birmingham and has a special Shakespeare room which is a lovely touch!